Disney Cruise Line is owned by The Walt Disney Company and headquartered in Celebration, Florida. 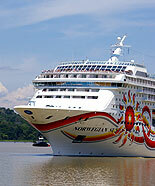 It operates two cruise ships, the Disney Magic and the Disney Wonder. 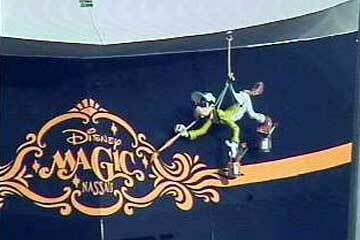 Beginning May 25, 2008, the Disney Magic is scheduled to sail 12 consecutive seven-night cruise vacations from the Port of Los Angeles to the Mexican Riviera ports of Cabo San Lucas, Mazatlán and Puerto Vallarta. Disney Cruise Line will also offer two 15-night repositioning cruises, sailing from Port Canaveral through the Panama Canal, departing May 10, 2008, with the return sailing to Florida on August 17, 2008. 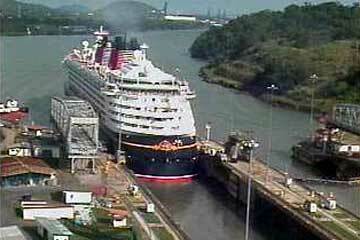 See the Miraflores Locks Camera - Disney Magic Record of Inaugural Transit on May 20, 2005 here on the Pancanal.com Website. Pictures from the Pancanal.com's LiveCam. Reuters reported here: A U.S.-owned cruise ship has paid a record $331,200 to cross the Panama Canal as vessels fight for space in the increasingly congested waterway, authorities said on Tuesday. 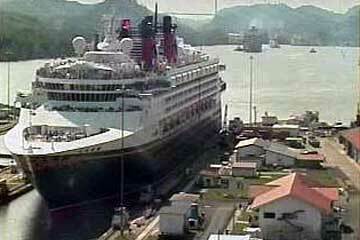 The 964-foot (295-meter)-long Disney Magic broke the transit record on May 16, the Panama Canal Authority said.